Home Famous people Who renames streets of Hanoi? Who renames streets of Hanoi? As Director of Hanoi from 20/07/1945 until August Revolution broke out, Dr. Lai Tran Van has done a lot of sense for the city, including the naming of most streets in Hanoi. After Japan overthrow French (03 Sep 1945), in April 1945, government close Japanese Kim Tran Trong established. In 20 July 1945, Japan delivered the administration of Hanoi, Hai Phong, Da Nang for Vietnamese people. Dr Lai Tran Van (1894-1975) was invited as a Director of Hanoi, the position equivalent to mayor. Received tenure from 20 July 1945 and the end when August Revolution broke out, Mr Lai Tran Van is the first and only mayor of Hanoi.Although only holding the Mayor in about a month but the he have done much work for the city, including the renaming of most streets in Hanoi. Lai Tran Van specific growth in a famous family mosaic occupation in Hanoi but studied medicine and became doctors. Always take thoughts against the French, so even a talented doctor in the Phu Doan hospital (now the Vietnam-Germany Hospital), the young man Lai Tran Van has been French detained in Son La prisons and Hoa Lo jails with people like Khanh Hoang Cong , Hoe Pham Khac. Historian Dr. Hai Duong Lan, daughter-in -law of Lai Tran Van (now living in old houses in the Tuc Mac lane), Lai said instrument was named the most from the streets of Hanoi before the August Revolution, including Tran Hung Dao street and small alley where the Tuc Mac that he lived. At the position of mayor of Hanoi, Lai Tran Van doctors have done both the primary, that uses Vietnamese wrote papers and books at the Court of Hanoi and renaming the street in Hanoi . 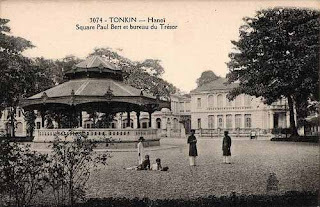 However, the first implementation that many people remember as “the removal of traces of slavery in France” is done by lower Paul Bert statue the next Hall, Jean Dupuis at the river road, Western lady in the Cua Nam gardens and monuments of blue loincloth soldiers in Hang Trong street. In 01 August 1945, Dr Lai Tran Van had personally ordered the destruction of the statue. Then, Dr Lai Tran Van perform of names changed Hanoi street. According to To Hoai writer, previously named Hanoi are French or the Vietnamese who have work with the French. But when it came to power,Dr Lai tool has renamed all of the street. Tran Van Lai’s vision remarkable in that, the name of Hanoi is not cluttered as in other cities that have been placed with deliberate way. Farther Tran Hung Dao street area of the famous general of Tran dynasty. That even Mac lane (located on Hung Dao before Tan Hung lane) are also named after the family hometown of Tran. Red River is also named as Van Kiep street, Binh Than, Tran Quang Khai, Tran Nhat Duat, are the names of the generals and the famous naval battle of Tran. Lifetime, Lai Tran Van is a very discreet, calm but extremely lenient. Lane’s house in particular Mac for years That is where poor people of Hanoi to the doctor and get medicine for free. People around the Tran Hung Dao Street are loved and trusted him. That in 1946, when the French attacked Hanoi fire, nobody told anybody, the first thing people do is run to Lai’s house depend on him to protect. Duration of the national resistance, although not about the war, but he show a supportive opinion Uncle Ho and the government resolutely refused all invitations to collaborate by the French government. 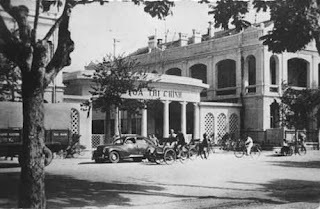 With prestige, personal effort and labor to the revolution, after 1954, Tran Van Lai tool is one of four Hanoi people who are Uncle Ho gave radio. When invited to help the revolutionary government, Lai was appointed instrument Deputy Minister of War Invalids and Social Affairs (at that time, Vu Dinh Tung is minister), then as Vice President of Administrative Committee of Hanoi City (Dr. Tran Duy Hung is the Chairman).